The most beautiful feature in Japanese Fall is Koyo, Autumn leaves. Japan has the most kinds of Koyo trees in the world. Koyo of Mt. Takao（高尾山の紅葉）is the most popular Koyo hiking in Tokyo. Koyo starts around the middle to the end of November in Mt. Takao. 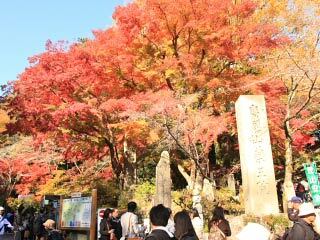 The mountain will be covered with a beautiful Autumn leaves from top to the bottom. Also, in this time, Mt. Fuji appears great from the top of Mt. Takao because air gets so clear. There are parking space, shops and restaurants. In this time, the cable car and ropeway lifts will be so crowed.